This may be the yarn I knit my first ever pair of socks with - the Fleece Artist Sea Wool arrived in the Post Box all the way from Little Knits in Seattle on Friday accompanied by 3 skeins of Muench Touch Yarn destined for the Vintage Velvet Scarf from Scarf Style, albeit a short version. "The seaweed extracts also promote the production of glucosaminoglycans, which not only accelerate the healing process of skin inflammations, but also protect the skin from free radicals (acc. to Alban Muller International). All in all, SeaCell® pure is more than just a fiber – it can promote activity and create a sense of well-being." I'm all for the promotion of activity, especially in socks. Along with all the welcome drought-breaking rain we had on Friday it seems as if the postal drought has cracked also. My International Scarf Exchange partner received her scarves and then gave a lovely write up on her blog. The High Anxiety I was feeling about that has subsided to be replaced by moderately high anticipation. There is still my scarf and a Knitter's Treat to come. Knitting of the second Cleckheaton Jacket is continuing at a speedy pace mainly because I have the armless body of the Interweave Knits Pullover Flair sitting in a prominent spot reminding me not to get too far ahead of my UFO's. I was very disciplined at the Guild meeting this afternoon and resisted the extensive display of our retail guests Rex & Evelyn Reynolds. They had a lot of Filatura Di Crosa and some beautiful Mohair. This is Evelyn showing off one of the many items that could be knitted with their yarn with two tables packed with fibre goodies in the background. That wool looks lovely, Kate. Yes, I've read that book by Victoria Finlay and loved it! I've also bought the one about the colour red that I haven't got into yet. I'm reassured to see that there is someone else who hasn't knitted socks - I started a pair last winter for my daughter's elderly neighbour - he'd noticed the little one in handknits and asked her if I could suggest someone who'd knit him a long pair of very warm socks for his poor old arthritic feet and legs. In a flurry of activity I started a pair but got to the heel and .... so I bought him a knee length pair of possum and merino socks when we were in NZ - he lovedthem. meanwhile....amongst the UFOs, lurk the unfinished pair! 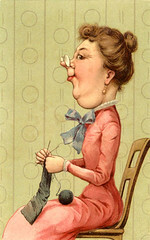 I love the yarn you'vebought for yours. The sock pattern looks nice, but they certainly aren't the easiest ones I've seen. I use a much simpler pattern which has almost no shaping, and they always fit perfectly. I, too, managed to resist two tables full of yarn; but I will be visiting Anita tomorrow for needles and a pattern for, you guessed it, men's socks! You Resisted Evelyn's never ending tables of goodies? V.impressive. Suddenly everyone is getting some of that Fleece Artist Sea Wool and I am so wanting to hop on that bandwagon - will keep on tuning in to see what yours looks like....full review expected please. The Fleece Artist yarn looks so good & I am sure that will knit up into a lovely pair of socks. Resistin 2 tables full of fibre goodies - that's really strong willpower. I won't be able to resist that!